Ever wanted to watch under-occupied and over-privileged young people stick it to the Man, railing against austerity while calling for anarchy, ranting about evil government while simultaneously demanding lots more of it – all while unironically dressed in a costume popularised by a big Hollywood movie? Ever wanted to watch pumped-up social justice warriors demonstrate their enlightened, compassionate credentials by tearing around central London setting off fireworks at police horses and smashing up cars and property without a thought for the consequences of their actions? Then November 5th is your lucky day, last year, this year and apparently every year for the foreseeable future. 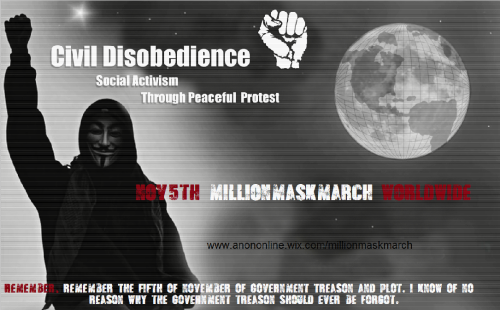 Forget Guy Fawkes and bonfires, the fifth of November is now all about the annual worldwide Million Mask march organised by that self-appointed moral minority, Anonymous. L’etat, c’est Lola. Apparently. Meanwhile, David Cameron – whom Lola was furiously protesting – has to settle for his rather more tangible mandate of having just won a parliamentary majority in the May general election. But sure, it’s purple-haired people like Lola who have their finger on the pulse of British society. 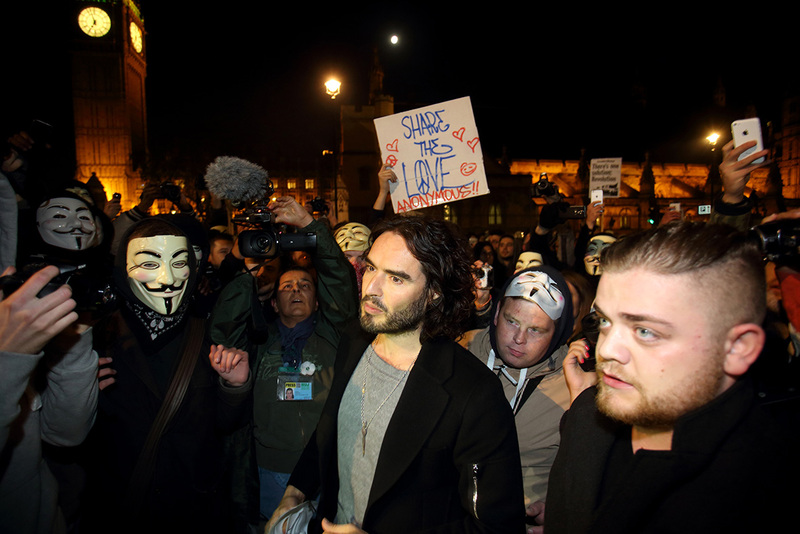 There was a mixed reaction among protesters to the appearance of Brand in Parliament Square, where he was quickly surrounded by both marchers and the media. And yet some people would have all of this amusing revelry brought to an end, forcibly prevented from happening again by the state. We have to start banging on about the right to protest a lot less, and start banging on about the right to law and order a lot more. Every time there is a “democratic protest” in Britain now – especially if the target of that protest is that catechism “austerity” – it is accompanied by intimidation and violence. We saw it at the Tory conference in Manchester. We saw it yesterday during the student protests. We will see it again tonight. People have the right to protest peacefully. But they also have an obligation to protest peacefully. And if they can’t meet that obligation – and it is increasingly apparent that many people cannot – then their right to protest has to be removed from them. The obvious problem: without a well-functioning pre-crime detection unit it is difficult for the state to know which protesters are most likely to cause violence without violating citizen privacy and making today’s draconian surveillance state seem like a libertarian paradise. Neither does he suggest where the tipping point between raucous free speech and something that warrants a ban should be. What ratio of peaceful to potentially violent protesters should prompt the state to overrule our right to freedom of assembly? Hodges speaks of “they” and “their” as though it would be simple for the state to quickly and easily distinguish between those protests which are worthy and those which are simply a front for violent troublemakers. But real life is never so simple. Legitimate and worthy causes are sprinkled with thugs and idiots no less than wacky or offensive campaigns, so would it be right for any future protest to be banned simply because it was infiltrated by a few violent people? As soon as you accept that the right of the people to assemble and exercise free speech should be limited based on some assessment of the “worthiness” of the protest in question – or of the protesters themselves – you grant enormous power to the person or people who have to make that judgement. And even if that person or committee sets out with honourable intentions, eventual creeping bias, misjudgement or corruption becomes all but inevitable. If your job consists of banning any protest which might have the potential to become violent, would you not adopt a rather risk-averse, quick-to-ban attitude for the sake of your own future career advancement? It may grate with some people, but we had a massive expression of our right to protest in this country back in May. Tens of millions of people took to the streets to make their voices heard. It was called a general election. If people want to protest against the result of that election, that’s fine. If they want to try and convince people to speak with a different voice at the next election, that’s fine too. But what they can’t do is what we’re going to see tonight, which is to try to kick and punch and scream and smash until they get their way. Because if they do, than that will represent the ultimate assault on our liberty. Not so. Allowing Anonymous to hold their annual anti-capitalist temper tantrum is an expression of our liberty, not an assault upon it. Our liberties can only ever be assaulted if we actually do what Dan Hodges clamours for us to do, and begin arbitrarily granting or denying the right of people to assemble and protest based on a sniffy assessment of whether or not we approve of them. That way lies the police state and the kind of tyranny that Anonymous might actually have legitimate cause to rail against. The key thing missing from the argument of those who would ban the Million Mask march is the all important question “or what?” Say that a public group wants to organise a large demonstration, but the state exercises its power to ban the gathering. What should be done with those who say “or what? To hell with your police state” and turn up anyway, in violation of the government’s edict? Do we start throwing people in jail? Dragging them through the courts, fining them and handing out criminal records? Slapping them with ASBOs or Control Orders, limiting their future freedom of speech and movement on pain of imprisonment? You can’t demand that something be banned by the state without following through and stating explicitly what you think should happen to citizens who say “or what?” and defy the ban. You have to be honest and state upfront the civil or criminal penalties that you think should be applied. Perhaps those who want an end to raucous and disorderly protest would like Britain to follow Russia’s world-leading standards in this field. Or our great ally Saudi Arabia. If idle, self-regarding young people want to combine their childish left wing politics with equally childish dress up games in central London or anywhere else in Britain, that is their choice and their inalienable right. Their freedom to assemble and speak is not contingent on having anything smart or worthwhile to say – which is just as well, in the case of Anonymous – and so their anti-capitalist shindig should not be banned simply for being eye-rollingly unoriginal. Besides, what problem would banning solve? Any exhausted parent of toddlers knows that sometimes, when their small child has a meltdown, the only thing to do is let it run its course. Parental interventions – bribing, begging or pleading for calm – will only make the shrieks louder and the tear-stained cheeks redder. So it is right now with the British political Left, who look at David Cameron’s very mild, vaguely centre-right government and remarkably see a combination of Genghis Khan and Hannibal Lecter. Talking to such activists rationally will not make much of a dent, except in the bruised heads of those unfortunate people who try. Therefore the only remaining option is to let the tantrum run its course, and hope that a calmer, more rational Left quietly emerges from their bedroom after Time Out is over. And so if the activist Left really want to play fancy dress once a year and prance around Westminster pretending to be profound thinkers or Voices for the Dispossessed, let them. Police the marches properly, sure. They happen once a year, and the government fritters away far more money on far more offensive things to complain about the cost. And if some of them get carried away and commit acts of violence or vandalism, by all means use that police presence – and the thousands of CCTV cameras already conveniently dotted around the city – to apprehend them and bring them to justice. The tricky thing about free speech is that its importance trumps nearly everything else. It has to, otherwise we cannot say that we even aspire to live in a free society. That means that the young anarchist’s right to wear a silly costume and shout about the evils of “austerity” trumps our right not to be offended by the delicious irony of a young, digitally-savvy student availing themselves of the fruits of capitalism to protest against…capitalism. It means that their right to hold up anarchist signs and look vaguely menacing in Trafalgar Square trumps our right to walk un-accosted through the streets of the world’s capital city on one day every year. It has to, otherwise what right do we have to take to the street in outrage at some future event, when we have denied it to those who are outraged today? Only by defending the rights of the infantile Anonymous protesters – and others far worse than them, like neo-nazis, anti-Semites, Islamist terror apologists and Katie Hopkins – do we preserve the principle of free speech and freedom of assembly for ourselves. The battle for free speech is won or lost at the margins. And while Anonymous may be immature and pugnacious, their well-worn anti-establishment message is nowhere even close to the margins of what anyone might reasonably term “unacceptable” speech. Besides which, if the mere threat of violence is enough to warrant a ban on public gatherings, I look forward to reading Dan Hodges’ next column calling for the abolition of professional football. 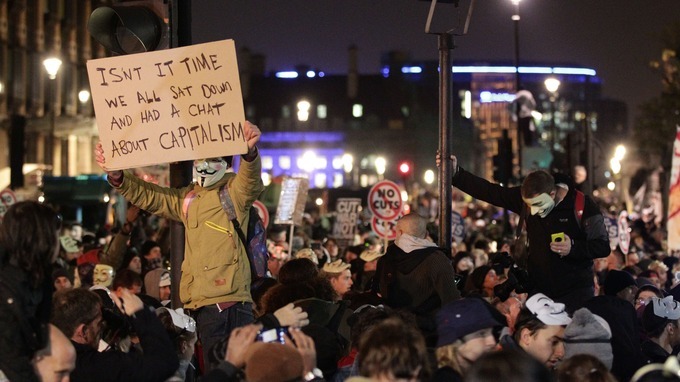 So let Anonymous descend on London, protesting global capitalism while wearing their plastic Guy Fawkes masks made in a Bangladeshi sweatshop. Those on the sane Left will simply have to grin and bear it, and hope that a good course of masked, anti-austerity blood-letting will bring their side’s hysterical anti-Tory fever back under control. And those of us on the libertarian right can just sit back and grab the popcorn. But ultimately, if free speech wins then we all win – left, right or any point in between. Again a really good article, I’m really enjoying catching up with your blog! 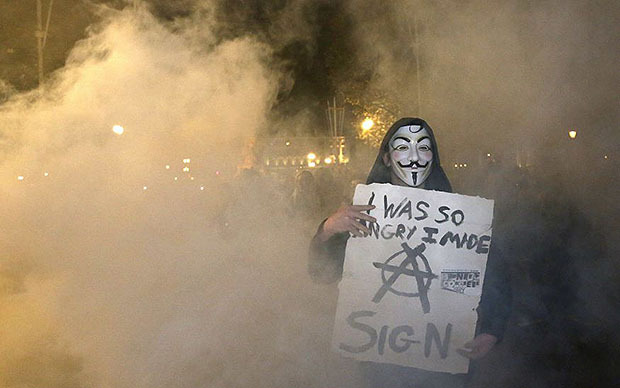 All protests have a small number of people who want to cause havoc, that seems to be more the case with Anonymous than with a lot of others but it wouldn’t apply to everyone who attends, and some people at least would have come to peacefully protest. The thing is that if you do actually want to give them a cause and a genuine way to gain the support of the general public, then all you need to do is deny them the right to protest. I said the same thing when they didn’t want the BNP to appear on question time, and I would say it apply’s to this as well. If you let people do their thing, you allow them to voice their opinions and you allow other people to critique them, and realize that what they say doesn’t stand up. If you don’t let them do their thing, even people who would never have agreed with their original arguments will start backing them in the same of free speech. So if you really want to boost a group like Anonymous, then take away their free speech. Not a very smart move. This seems to be happening much more than once a year. In a free society all property, including roads, would be private property. That might solve the problem? I’m the biggest free speech advocate out there but I don’t think it includes the unqualified right to disrupt others by blocking traffic etc even without violence. Thanks for reading and for the comment! Hope you’ll stick around and read more. You make a fair point, there is no unqualified right to mess around with peoples’ commutes and disrupt key public infrastructure or services day after day. But there are usually just two or three sizeable anti-austerity protests a year in London. I go to most of them, in the spirit of keeping the enemy closer. And the levels of violence have never been anywhere close to the level where a blanket ban on assembly might be warranted. Do we limit the number of large protests allowed in central London to a set cap every year, and then let the activists fight amongst themselves for those slots? Or worse still, do we have a committee that chooses which causes “deserve” a hearing? Fortunately, most protesters work with the police to create safe and manageable events. In these cases, disruption can be kept to a minimum for those people just trying to get on in the city. Those protesters that do what they want, deviate from the agreed march routes and interfere with innocent bystanders are inconsiderate jerks, but what steps can the state possibly take to stop them that would not also be a huge infringement on the general right to assemble? We can’t have a law that says “spotty teens in halloween masks with adolescent views about capitalism, specifically, shall not assemble on the streets in groups of three or more, on pain of six months in jail or a £5000 fine”. At present, I think these Million Mask marches are a silly irrelevance, one that does my job of ridiculing the Left for me. The violence and criminal damage are deplorable, but to restrict the way we allow and police public demonstrations as a result of anything that happened last night would be a major reaction. That would be my additional 2 cents. It’s sad London did not follow suit of the rest of the world with peaceful protest. I blame both sides but mainly the police for insight violence with ketteling and aggressive nature. Yes I sure some protesters were aggressive but why your pushed around and not allowed to leave when you want, what do you expect. This happens time and time again in the UK the police march towards the crowds with baton raised, aggressively shouting “move back” like a robot on overdrive. Dictating everything they needs to be dialog. People want to leave then they should not be forced back and beaten with buttons. Kettleing has been proven wrong and to cause aggression yet they carry on, it’s not just the young cause this violence! Let’s all be thankful that the Metropolitan police were not given approval to use their new water cannons. That’s about the only liberty-minded decision Theresa May has taken in all her six years as Home Secretary (and even that was only to embarrass Boris Johnson, who purchased the things). Thanks for reading, and for the comment.